Whooohooo... looks AWESOME!!! Have been following the info leaks for weeks in anticipation of this event. Congratulations Craig, and best wishes for a successful endeavor. Looks fun. Not sure if I'll be able to get my hands on it, but I want it. Great job Craig!!! So it begins! Best of luck to the Van Nesses, I hope this fun game gets to be shared with the world. Sweet! I hope to be able to back at the beginning of March. I have loads of money in kickstarter right now, and hope to back this one. PS: as a guy addicted to buying miniatures will there be more minis than just the dragon. If so, and they are stretch goals that would be cool too. Just backed for a dollar, but will up that after tax returns. One dragon in this game. We looked at minis for everything, but it would have driven the retail price too high. You should have told TREX that he can use his HeroScape figures as the mini's for this new game if he is so inclined. We've probably all got enough of a variety already to cover every race of creatures imaginable, hahaha, j/k It may have seemed rude for you to say it so bluntly, so I did for you (~~lol~~). 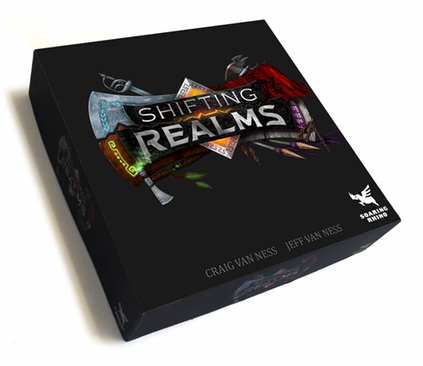 BTW: I remember that Orcs, Elves, and Dwarves were mentioned in the "Shifting Realms" video, why couldn't we use existing mini's as game pawns for it? I had thought of that very idea johngee. CVN im going to throw in even if it is one dragon. The game does look intriguing. Im starting to get my stuff from my last years kickstarter splurge now. Tax returns made it in yesterday, and a full pledge to Shifting Realms has already happened. Come on people he needs more! May your rhino forever soar! I'm now a backer. May we have more backers to help it come alive. Just got the email that the project has been cancelled and that they will try again in June. Thanks to everyone that backed!